Four Courts Press, Dublin, 2015. 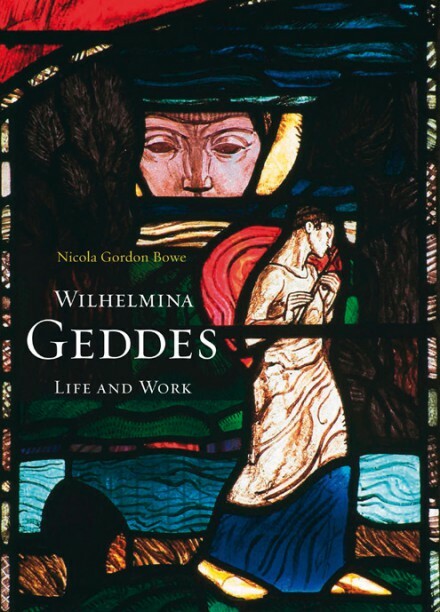 Nicola Gordon Bowe provides a rich and evocative study of the life and work of the stained glass artist Wilhelmina Geddes (1887-1955). This intriguing study asserts Geddes as an original and modern artist of international importance by considering her work in context. Using the surviving diaries Geddes kept as an art student in Belfast and Dublin, the letters she wrote over a twenty-five year period to her mentor, the artist Sarah Purser, as well as other primary material, Bowe constructs a vivid picture of Geddes’ international achievements in stained glass and the wider Arts and Crafts Movement. She does this through examining the involvement Geddes had with the Irish co-operative An Túr Gloine, her development of acclaimed war memorial windows in Canada and Belgium, and examining in detail her powerfully expressive and masterfully crafted stained glass, graphics, and needlework. Wilhelmina Geddes’ life and work are set in the context of a turbulent, yet intensely creative period in the history of the early twentieth-century Irish Cultural Revival and the Arts and Crafts Movement. During this period, a progressive school of artists, committed to direct involvement both in making and designing stained glass emerged, reinventing the medium into an expressive art form. Using innovative materials and techniques, this new approach looked towards medieval traditions and producing colourful stained glass, using dramatic designs and symbolism. Recent studies demonstrate how women made critical contributions to the renewal of stained glass as artists and entrepreneurs, allowing them to gain meaningful equality with their male colleagues, more fully than in any other applied art. Bowe’s biography of Geddes compliments this recent research, restoring Geddes’ artwork to its proper status in the Arts and Craft Movement, and her prominent role in the movement’s exhibitions and publications. The first chapters examine Geddes’ initial engagement in the world of art; her formative visits to Ayrshire, and her development in life drawing, illustration, and printmaking at the Belfast School of Art. Although she remained living in Belfast, Geddes became one the main designers for An Túr Gloine, Sarah Purser’s pioneering Dublin glassworks co-operative. Purser brought Geddes to Paris and Chartres to see the medieval stained glass, which had a profound impact on Geddes’ artistic approach, influencing her design aesthetic, and intense colour palette. Geddes’ distinctive modern style drew on diverse influences, including Assyrian sculpture, Romanesque Gothic art, and the modern figurative sculpture of Henry Moore and Jacob Epstein. Like her contemporaries, Geddes benefited from numerous commissions for stained glass memorials in the wake of the First World War, which are examined in Chapter Four. The Ottawa Memorial Window (1917-1919) for St. Bartholomew’s Church in the Canadian capital was particularly admired by critics, connoisseurs, and experts, and described by Charles J. Connick, the eminent Boston stained glass craftsman, as a ‘courageous adventure in the medium’ (124). In this window, and others produced for Dublin churches, Geddes’ interpretations of Biblical stories are rich and symbolic, depicting strong and distinct male and female saints. While Bowe concentrates on the stained glass that Geddes is best known for, she also highlights other media such as printmaking and textiles. The analysis of toys made for the Suffragette movement, embroideries for Church tapestries, stamp designs for Saorstát na hÉireann, and catalogue covers for the Irish Arts and Crafts Society, stresses Geddes’ diverse range of craft skills. The final of the six chapters explores the increasing international success Geddes received during the 1920s and 1930s. In 1926, Geddes relocated to London and rented a studio at Lowndes and Drury’s Glasshouse. The 1920s were something of a golden age at the glass house with Harry Clarke, Karl Parsons, and Martin Travers, among others, producing some of their finest work in collaboration with Lowndes and Drury’s craftsmen. Chapter 9 considers Geddes’ major commission for a 25ft-diameter rose window in the south porch of Ypres Cathedral to commemorate the Belgian King Albert I. The Ypres window was widely reviewed by art critics, who singled out Geddes’ work as exemplifying the ‘vigorous modernity’ of ‘the woman designer of to-day’ (page 313). Despite the fact that Geddes’ output was small, with only thirty stained glass commissions completed, her centrality to the Arts and Crafts Movement is conveyed in the regularity in which critics admired her artwork. On her death she was described by John Piper as ‘the greatest stained glass artist of her time’ (page 411). While Gordon Bowe makes clear efforts to highlight the critical acclaim Geddes received in the early twentieth century, little attention is given as to why her artworks did not receive high praise in subsequent generations, and why her stained glass has largely been forgotten. Throughout the publication, Bowe skillfully considers the sources on Geddes’ achievements in her artistic career together with diary accounts of her difficult family life, financial problems, and fragile mental health. Despite her frequent commissions and artistic achievements, Geddes suffered from doubts and anxieties about her work. The biography uses notes for the psychoanalytical treatment Geddes received at the Maudsley Hospital after a nervous breakdown in 1925. Her medical reports show how Geddes found artistic outlets for the depression that assailed her. Geddes’ diaries exclude any political reflections, even while she was living during the Irish revolutionary period, First World War, and the London blitz. However, Bowe adeptly conveys the complexities and difficulties surrounding Geddes’ life and artistic output during this era in Dublin and London. Like many women of this generation, Geddes lived in a succession of lodgings, underwent frequent ‘starvation days’, and often borrowed money unless she had just been paid for a job (page 364). Wilhelmina Geddes, Life and Work is effective at highlighting Geddes’ artistic achievement, demonstrating her international importance, and contribution to the field of modern art through her stained glass. Sumptuously illustrated throughout, Bowe’s strengths lie in her ability to highlight Geddes’ powerful technical ability and proficiency in her craft. The personal sources used by Bowe provide an invaluable insight into the uncompromising and willful soul of Geddes, whose utter commitment allowed her to continue her artistic pursuits, despite continuous poverty, occasional starvation, and health-related problems. This is a thoroughly engaging publication, which would interest readers across the fields of gender, Irish art and craft, and those with a general interest in social history. It offers a detailed account of an early twentieth-century Irish female artist, whose work until now did not receive the attention it rightly deserved.